Pesto Potato Soup is absolutely awesome. Not a little awesome…I mean outstandingly awesome! 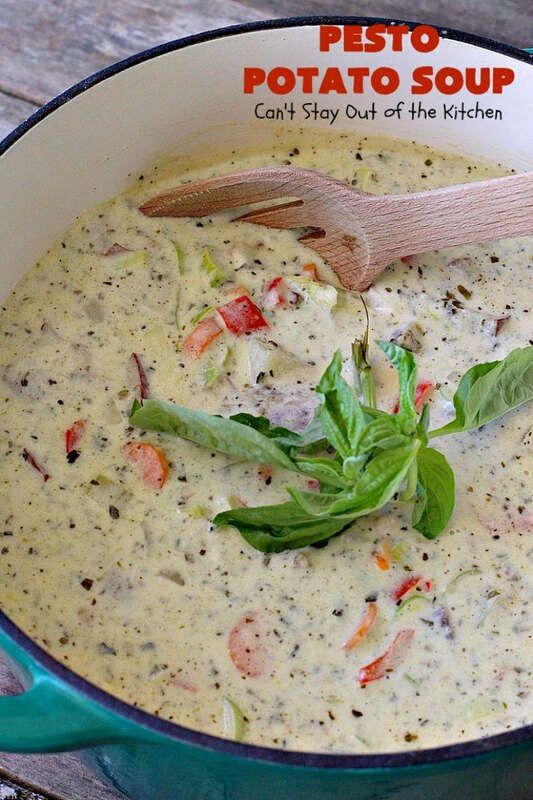 This amazing chowder is heavenly. 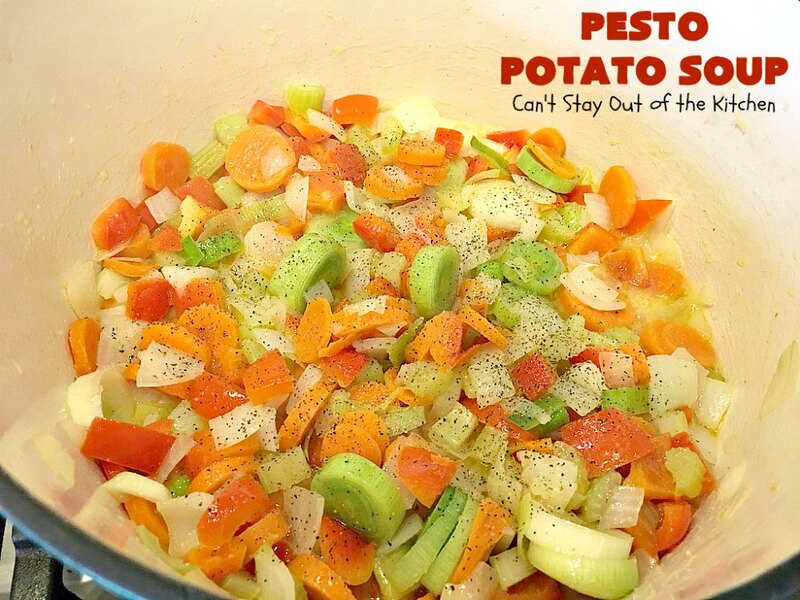 It’s chocked full of pesto sauce, potatoes, parmesan cheese, carrots, leeks (my favorite veggie) and bell peppers. 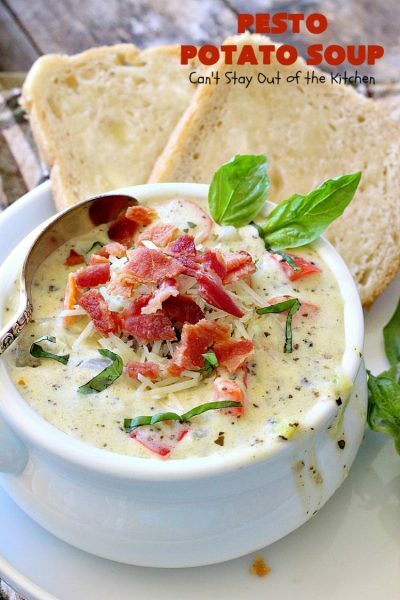 This recipe is made with gluten free flour and then topped off with bacon and parmesan cheese for garnish. This is one mind-blowing soup. I made up a double batch of Pesto Red Potatoes in May for one of our Friday night care groups. I served it with my favorite chicken dish and a Slow Cooker Creamed Corn. I ended up with about half the potatoes leftover. Normally, I parcel out the leftovers to anyone who wants them. For whatever reason that didn’t happen that week. 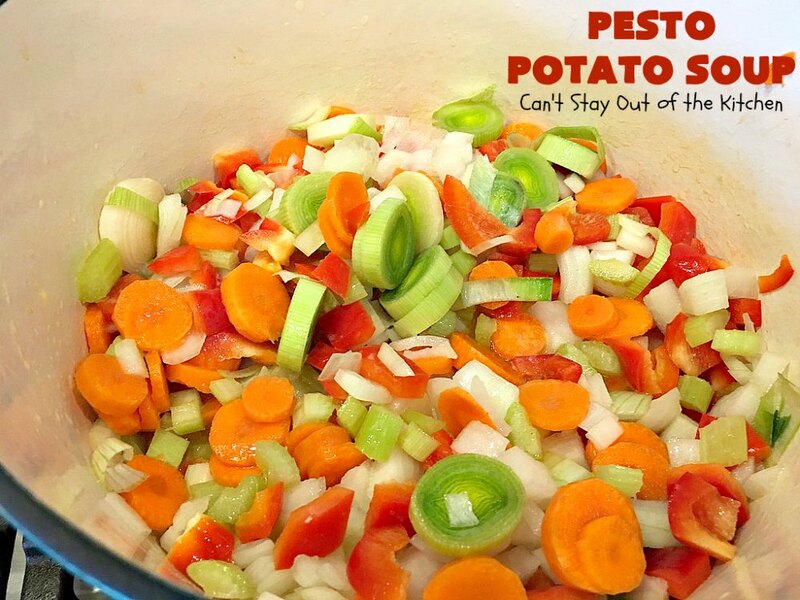 As I saw the potatoes sitting in my refrigerator for a few days I decided to make a soup out of them. I actually planned to serve them the following week when I served Chicken and Dumpling Casserole, just to provide another option. But then I found out that our neighbor across the street had just undergone a kidney transplant. His wife had been the donor. (Very rare–one in 100,000 chance this works out). So I decided to make them a meal and included this delicious soup. In fact, it was one of those recipes that they raved over! 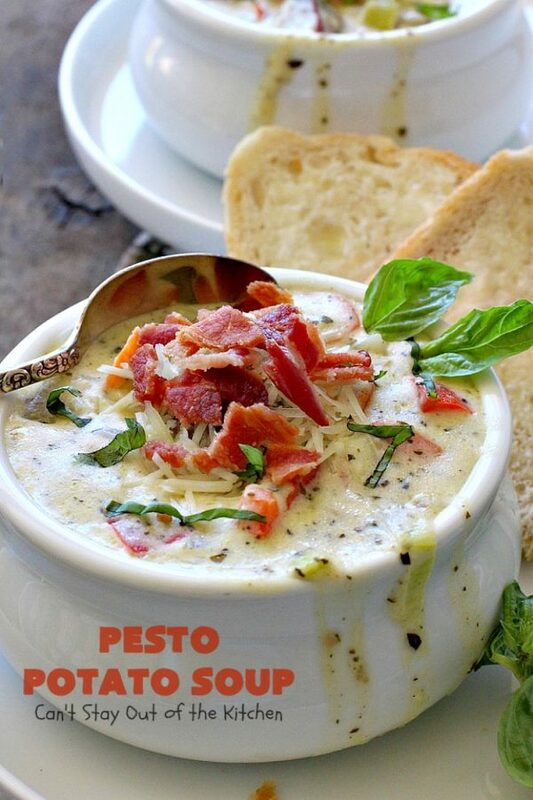 The combination of pesto sauce, parmesan cheese and bacon is exhilarating! 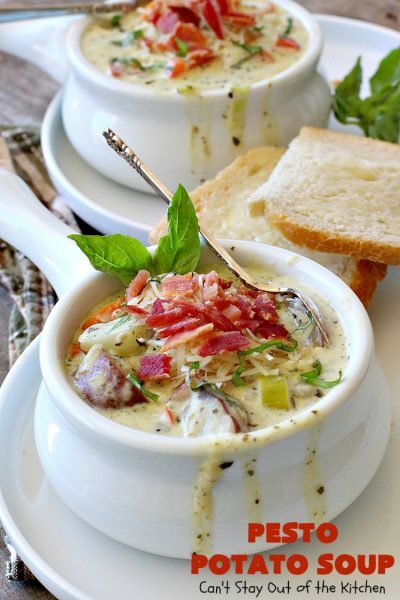 It totally amps up the flavors in this potato soup recipe. Seriously, I could have eaten bowls of the stuff. The flavors were drool-worthy. (And I don’t say that about anything except dessert, usually). The soup was so good that I plan to make it again soon. While this soup is terrific for fall and winter months, I enjoy eating soup even during the explosively hot days of summer. (Yes, Texas usually has plenty of 100+ degree days, depending on how much or little rain we have). This is a wonderful recipe to make when you make up an extra batch of the Pesto Red Potatoes (like I did). 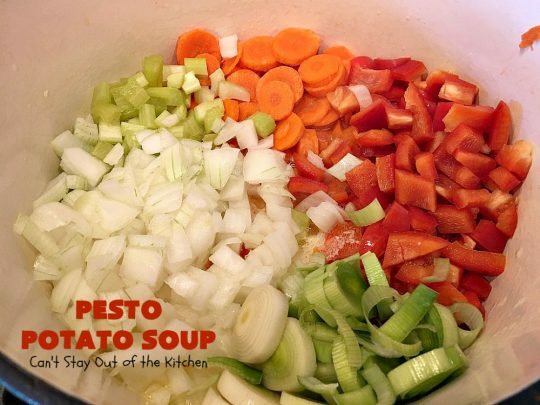 But I’ve given directions on how to make an individual batch in order to make this soup. All in all, this is one of the best tasting soups I’ve eaten this year. While I made it gluten free, you can also use regular flour if no one in your family has gluten intolerance. 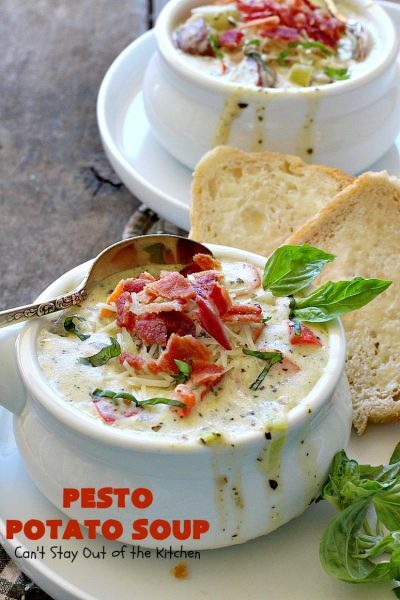 Just make sure you top it off with some fresh basil, parmesan cheese and bacon to get the full essence of the soup. We loved it and believe you will too. 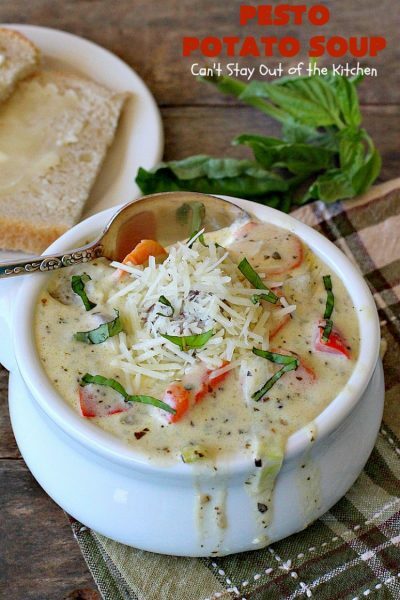 Pesto Potato Soup is absolutely awesome. 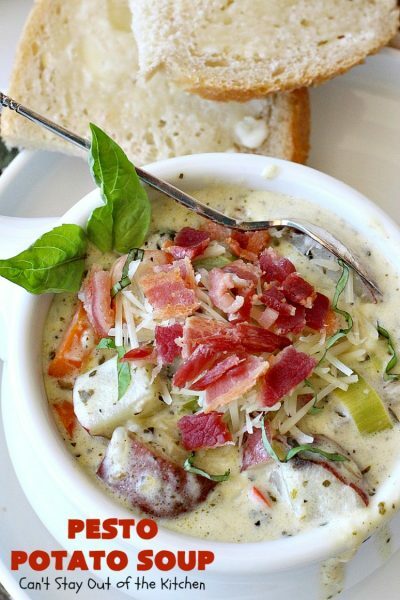 This is one of the best soups you’ll ever eat. It’s marvelous topped with parmesan cheese. But who can go wrong with bacon? 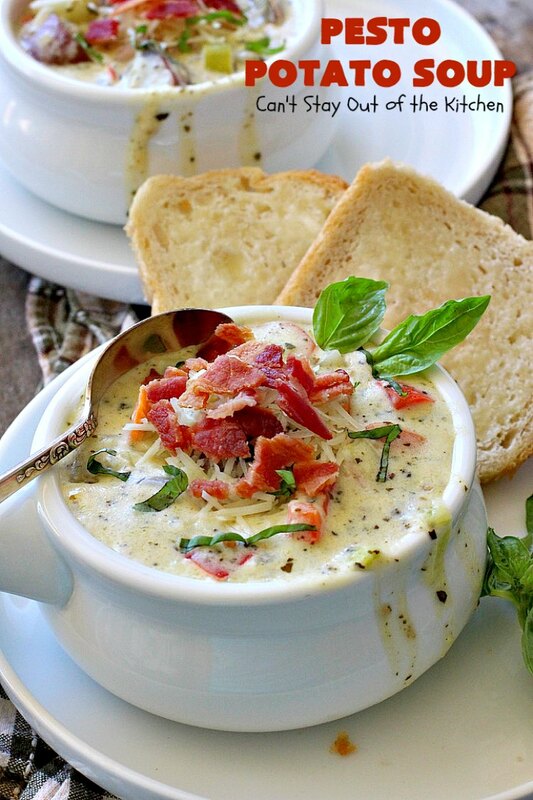 The pesto sauce and parmesan cheese really cause this soup to explode with flavor. It’s wonderful. I used these ingredients. The glass bowl contains leftover Pesto Red Potatoes. You have two options here. 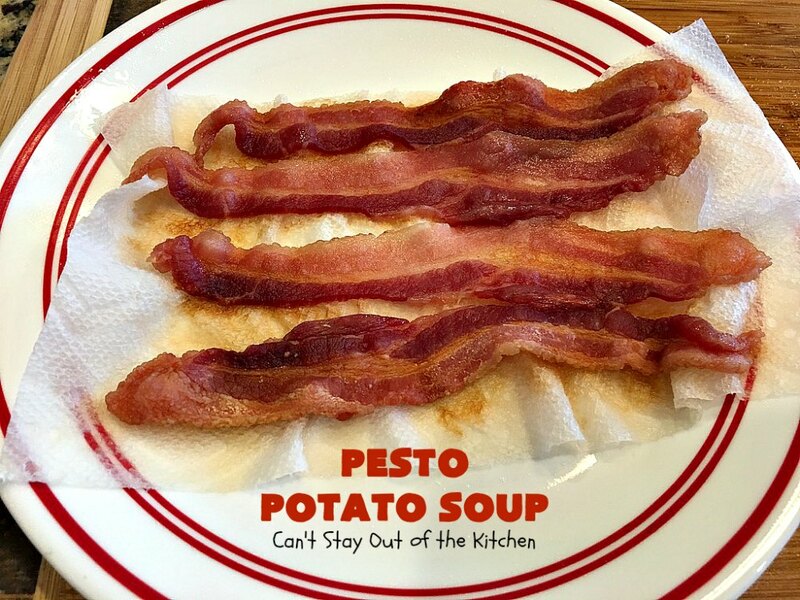 You can saute the bacon and cook the soup in the bacon drippings if you want increased flavor. Or you can microwave the bacon between two sets of paper towels for about 4 minutes on high. After cooking the bacon, break into pieces for serving and set aside. Melt butter in a Dutch oven or large stockpot to medium heat. (Or use bacon grease if you prefer). Stir to combine. Saute veggies about 5-10 minutes until a fork pierces through the carrots easily. You can cover the ingredients with a lid to speed up the process, if necessary. Add gluten free flour. Whisk to combine. 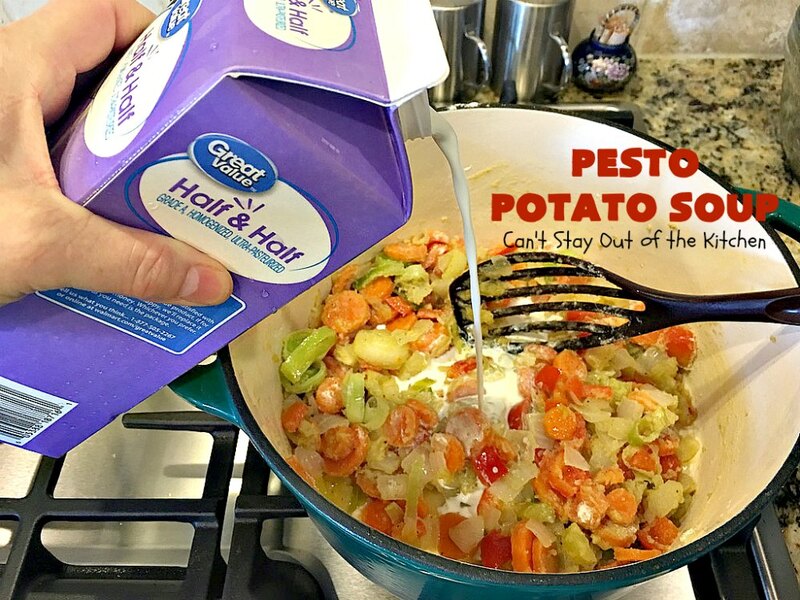 Begin adding half-and-half a few tablespoonfuls at a time until it’s fully incorporated. Reduce heat and allow sauce to thicken – about 5-10 minutes. Stir in one batch of Pesto Red Potatoes. Include all the oil from the pesto sauce. I piled the bacon on top of the parmesan cheese. Serve Pesto Potatoes with Sourdough Bread or your favorite gluten free bread. 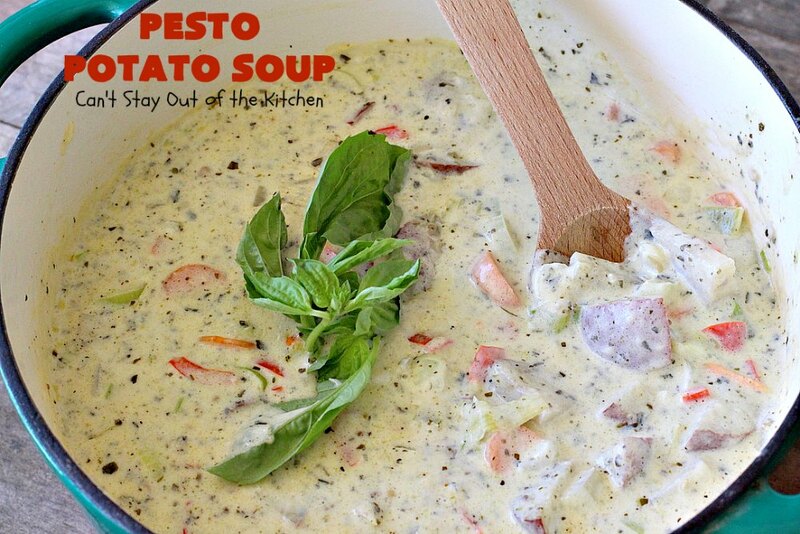 Pesto Potato Soup is absolutely awesome. 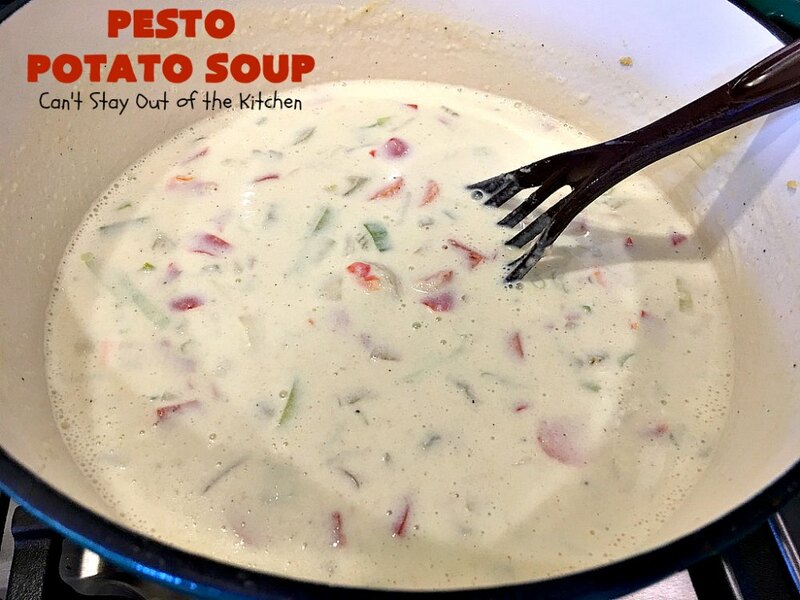 This soup is filled with red potatoes, carrots, leeks, & bell peppers and seasoned with basil pesto sauce, parmesan cheese and bacon. It's terrific for fall or winter nights and certainly nice enough to serve for company. We love this recipe! 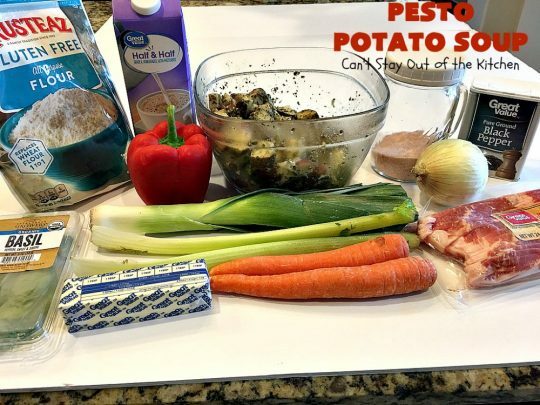 Prepare Pesto Red Potatoes. (See note below). While potatoes are baking, fry bacon. In a large stockpot or Dutch oven, melt butter over medium heat. Add onion, leek, red bell pepper, carrots and celery. Sauté about 5-10 minutes until veggies are tender and a fork pierces through the carrot slices easily. You can also cover the ingredients with a lid to speed up the process a little. Slowly add half-and-half a few tablespoons at a time and whisk until each addition is fully incorporated. Reduce heat and allow sauce to thicken, about 5-10 minutes. Stir in Pesto Red Potatoes. Ladle soup into bowls and garnish with bacon pieces, shredded parmesan cheese and fresh basil, as desired. 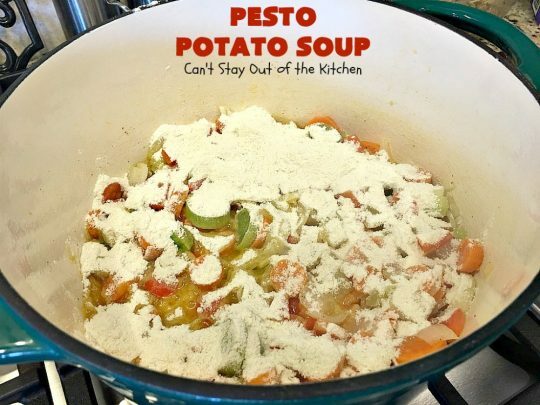 NOTE: To make Pesto Red Potatoes: wash and cube 2 ½ lbs. red potatoes. Add an 8-oz. jar basil pesto and stir to combine. Spread onto a greased cookie sheet or large baking dish sprayed with olive oil cooking spray. Sprinkle one cup of freshly grated parmesan cheese over top. Cover with foil. Bake at 350° for about 35-45 minutes or until potatoes test done with a fork. NOTE: If you want the bacon to flavor the soup, omit the butter and sauté the veggies in bacon grease instead. NOTE: I usually microwave the bacon on a plate between two paper towels about one minute per slice. If the bacon is really thick, I add additional time. NOTE: Cook time and preparation time does NOT include time required to make the Pesto Red Potatoes. 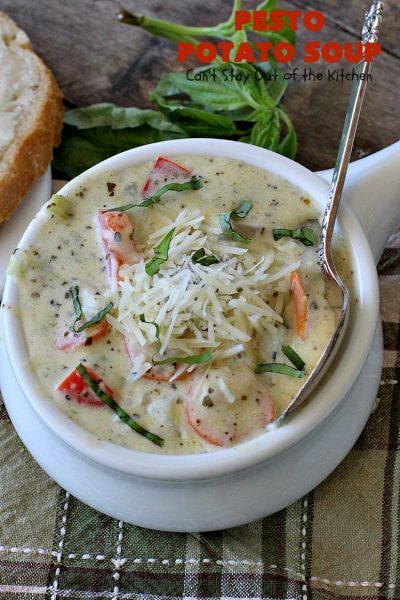 I loved how the pesto sauce, parmesan cheese and bacon really amped up the flavors of this chowder. 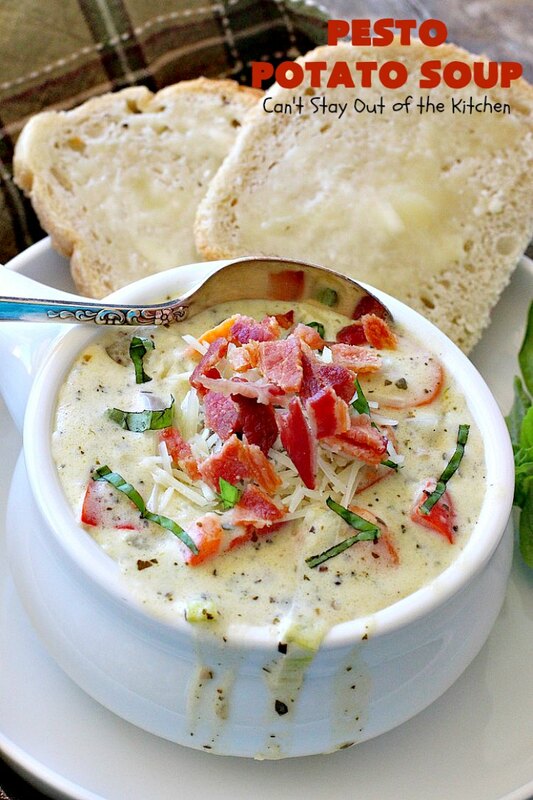 This soup is hearty, filling and so satisfying. 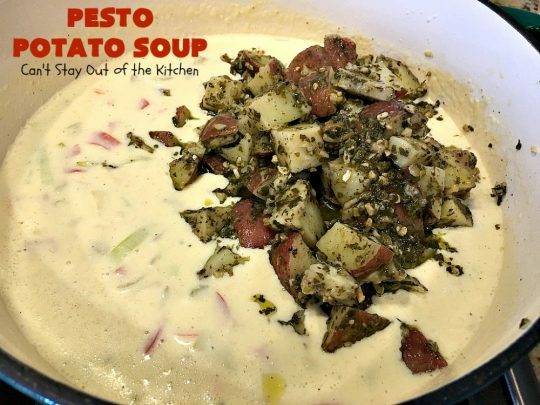 Pesto Potato Soup is real comfort food. Prepare to enjoy the best cup of potato soup ever!